In Cairo, the ancient clashes with the modern in an extraordinary way. Cows chill out underneath a motorway overpass. 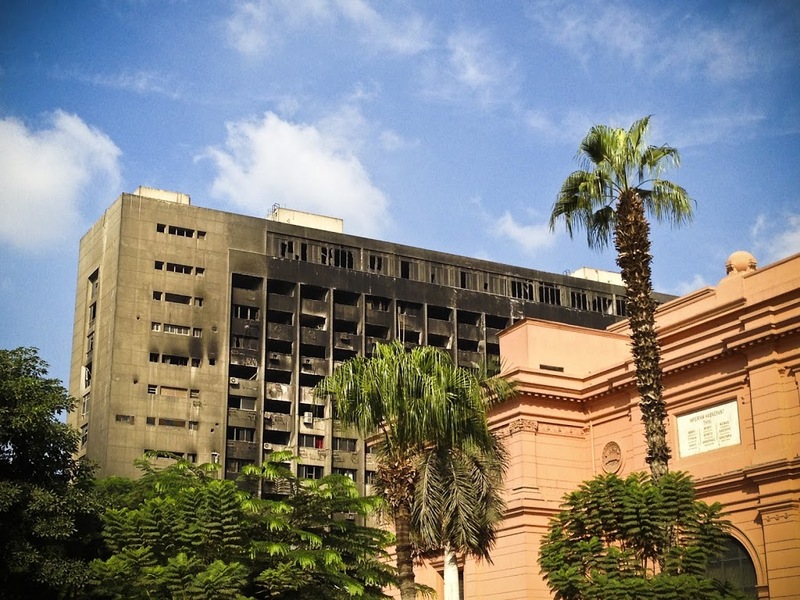 The ancient remains in the Egyptian museum are right next to the burnt out ruins from last year’s revolution. The burnt out remains of Mubarak’s headquarters behind the museum. The trip from Cairo to Giza is half an hour through slums that all seem to be a dozen or more storeys high. Between the endless squalid apartment buildings, I spot a marvel of ancient engineering that still has scholars scratching their heads today.I’m not sure what I expected the parking lot to look like, but I was shocked by how… unremarkable it was. This is the only surviving wonder of the Ancient world, and you just kind of stumble up to it, right next to a main road and opposite modern shops. But I quickly forget the lack of awe in the introduction when I get closer. There’s more than enough awe in the spectacle of staring at it up close. Apparently there are over two millions bricks, and the ones I can see are all bigger than my first car. I scramble up the side to the entrance, and creep inside. After climbing for what seems like an age, I reach a tall shaft. Thanks to the wonders of modern lighting, I can see a path running up the centre. As I climb, I’m impressed by the height. 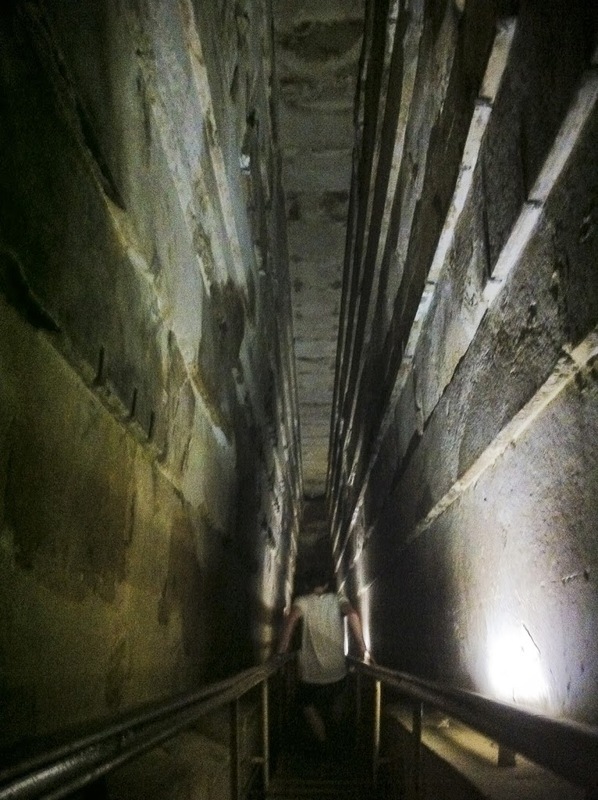 Apparently King Khufu wasn’t too happy with the original plan of an underground tomb beneath the temple. He wanted something more grand. I find myself contemplating who exactly he had in mind when he requested such a grand design. Right now it feels like I’m the only person besides his architect who has ever had the opportunity to admire it. At the top of the shaft is a bedroom sized tomb. It looks austere and simple, but if the treasures I saw this morning in the Egyptian Museum from Tutankhamen’s tomb are anything to go by, it would have been anything but austere when first constructed. I close my eyes and try to imagine the space before the musty smell set in. Piles of handy things for the afterlife. Gaudy colours. The smell of lotus flowers and papyrus. And in the centre of the room, a sarcophagus fit for a king. Layer upon layer of solid gold. 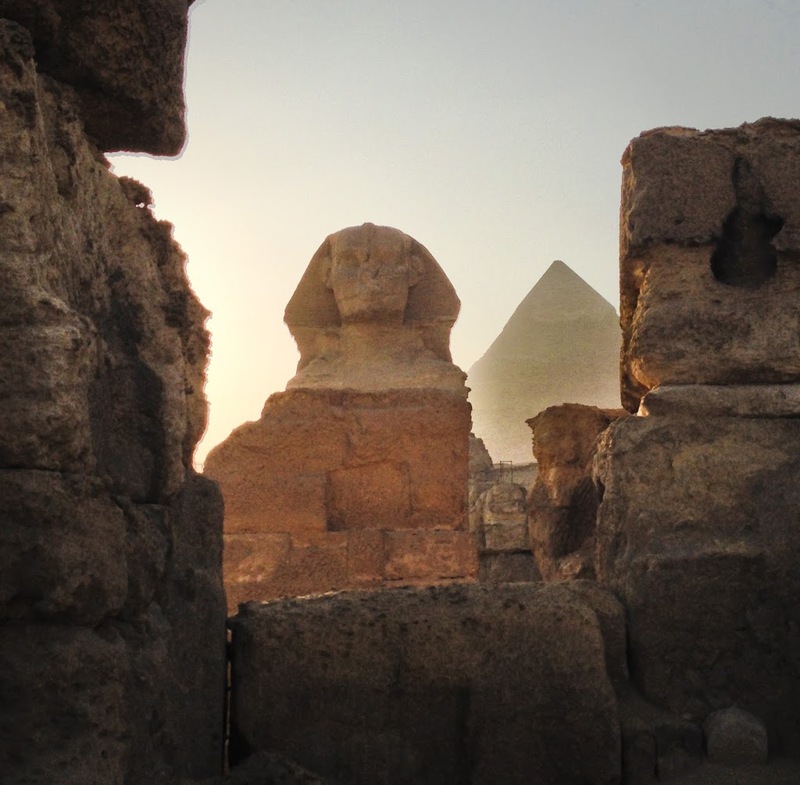 Of course, all this disappeared centuries ago when the ancient Egyptians ransacked their own king’s tomb – so modern archaeologists have known only the same space I’m observing now. About half an hour later, I’m introduced to Alice. Well, actually she wasn’t introduced to me, so I christen her ‘Alice’ myself. She has golden hair and a very long tongue. 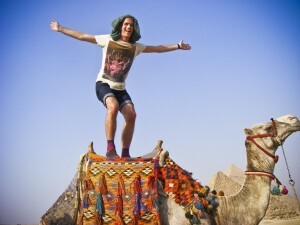 Alice was the last camel to be chosen – everyone else was given away first. I’m a little worried that this might mean she’s the rogue of the pack. When Alice stands up, she lurches forward on such an angle that I feel like I’m about to plummet head-first to the ground. But somehow I survive, and start to feel quite comfy in my new perch a few metres in the air. We’re connected in chains of two or three, and a little boy leads Alice over the sweltering dunes in the direction of the pyramids. I hand him my camera and he begins taking pictures. Along the way, Alice picks fights with every camel we pass ,snarling and snapping until the little boy tugs her away. Not wanting to be outdone by a seven-year-old, I decide to trust Alice with my life and give it a shot. Hey presto! On the way back, while free from the little boy’s grip, Alice decides to go for a wee gallop. As we gain speed, I lean in tight – afraid that this could be the last anyone sees of me until I perish from starvation somewhere in the Sahara clinging for dear life to the back of a wild camel. But she slows as we approach the camp, and I realise she’s not wild – just competitive. There’s a moment on every good trip when you realise “this has been worth the time and expense it took me to get here”. Only on the best trips do you reach this point on the first day. 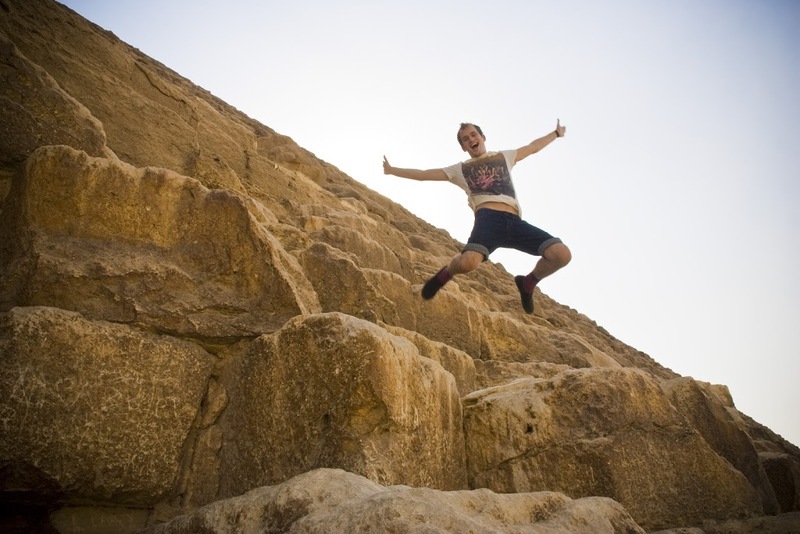 As Alice lurches abruptly forward onto her knees to let me off, I realise that Egypt has already proven itself worthwhile. 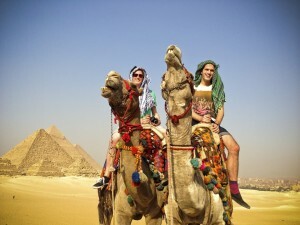 Find out more about Busabout’s 10 Day Egypt trip here. I travelled to Egypt with support from Busabout and Flight Centre UK.